The specification list is impressive: a 16mp m4/3 sensor is at the G3's heart, which provides 4592 x 3448 pixel JPG or 12-bit raw images. Up top we have a pretty standard Mode dial with extra positions for Art Filters, Scene Modes, and two Custom User settings. The shutter release is big and easy to find (though ever so slightly wobbly on my copy), and Panasonic has used my favorite power option: an on/off switch�(located around the Mode dial). 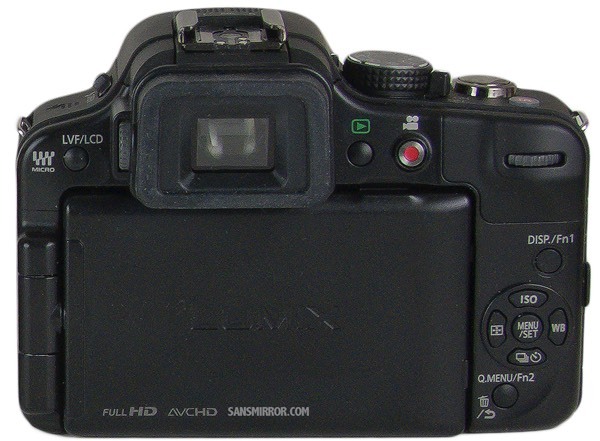 There's a hot shoe centered on the lens axis, a pop-up flash, and stereo microphones on the "prism" area. As with most Panasonic cameras these days, there's an iA button to quickly convert the camera into a reasonably intelligent all-automatic shooter. The big news on the back comes in two forms: the 3" 460k dot touch sensitive LCD, which has full swivel capabilities (including swiveling to protect the display during travel, as shown above); and the 1/2" 1.44m dot EVF view piece that juts out behind the back a considerable distance (over a half inch). The swivel LCD strangely has a 3:2 aspect ratio, which means that the full screen is not being used for framing. I wouldn't call it bright, but it's reasonably usable outdoors. The EVF has a diopter adjustment of -4 to +4, which is a fairly large range. Eyepoint is 17.5mm, and it works decently for those who wear glasses. You toggle between the LCD and EVF with a button just to the left of the view piece for the EVF. There is no auto-sense for switching between LCD and EVF. Other features of note are a tripod socket centered on the lens axis (useful for those trying to do panos, amongst other things), and a very large plastic grip sticking out the right front side of the body. 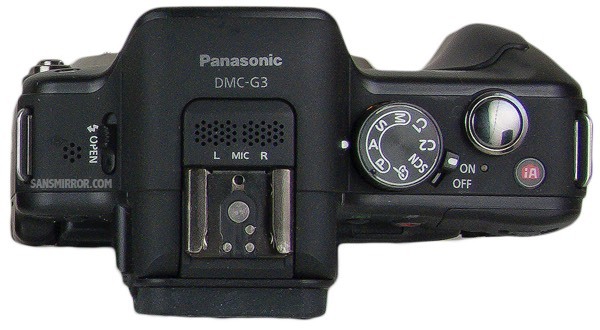 As with most Panasonic cameras, the camera strap lugs are aligned so that the camera doesn't hang cocked off a neck strap. That last is a small point, but it's one that a lot of cameras miss, and it's one of many examples that shows that the Panasonic engineers are photographers and understand how those small things can add up into a customer negative experience. In terms of performance specifications, the G3 is a mid-pack shooter: 4 fps at full resolution, 7 shot raw buffer (unlimited with JPEG with a fast card), 1/160 flash sync speed, 1/4000 top shutter speed. ISO starts at 160 and can be set to up to 6400. One of the nice things about Panasonic's higher end designs (and even some of their lower models) is that someone who photographs actively must be involved in the designs. 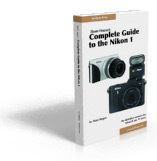 I write that because the GF1, GX1, GH1, GH2, and G3 models all share one attribute: controls fall nicely in natural hand positions, aren't missing or in impossible-to-use positions, and most things you want to set while shooting�are available either directly or with very little hassle. Panasonic has pretty much perfected the Quick Menu concept. On the G3 you have two ways of triggering it: touchscreen or function button (FN2 is normally assigned to Quick Menu). While we've got 10 things crammed into the Quick Menu now—which necessitates a second scrolling page—it's still a darned sight easier to tap the direction pad (or the touchscreen arrow) a couple of times to get to the thing you want set rather than navigate through complex, deep and wide hierarchical menus (think Nikon DSLR or Olympus). There also is some strangeness in organization. Why have a separate Fn BUTTON SET (yes, that's one of the few lower case characters in the menus) when it probably should be submenus of the Fn1 and Fn2 customizations? You have to pick to set those buttons to Fn1 or Fn2, then go somewhere else in the menu system to actually set what Fn1 or Fn2 are. There was a more direct approach available, but it wasn't taken. Likewise, the image displays while shooting are a bit cluttered looking (especially with touchscreen active as well as icons). Add a histogram and some grid lines and I've seen less complex heads up displays on fighter jets. The view through the EVF, fortunately, is a little better, especially since the touchscreen stuff goes away. The lack of an automatic eye detector to switch to the EVF from the LCD is something a few will miss. I didn't. It's easy enough to find and press the button if you shoot with the G3 for more than a few minutes at a time. Moreover, because the camera is designed well enough to keep my eye at the viewfinder while setting most things, I just don't have all that much use for an auto-switcher. On cameras that do have one, the usual complaint is that it doesn't switch fast enough, or failing that, that it is too prone to switch when anything is near the viewfinder (including your finger on the touchscreen ;~). So while others have criticized Panasonic for omitting an auto eye detect function, I'm not going to. I was using the G3 side-by-side with a camera that did have an eye detection device, and frankly, the G3 wasn't the camera that annoyed me more when it came to switching the EVF. My one smallish physical design complaint has to do with the size of the rear command dial. It's most recessed and it's a small control on top of that. With thin gloves on, I don't always find it and can't always engage it correctly. Battery: At least Panasonic has been consistent amongst a generation of cameras with batteries for a change. My GF2, G3, and GX1 all share the same battery (BLD10). Unfortunately, it's a smallish battery (1010mAh). Using the EVF all the time I chewed through batteries, sometimes three or four a day. The touchscreen wasn't much better, though did seem to last longer. 300 shots per charge often turned out to be my limit, even using conservation methods. Simple answer: make sure you have spare batteries with you. Since low-cost, third-party batteries are available, that shouldn't be a big deal. Still, it would have been nice to have a couple hundred more mAh. Focus: It didn't help that I was evaluating the G3 while I was also testing the Nikon V1. Nikon definitely raised the bar for mirrorless camera focus performance, and that was clearly evident to me using the two side by side in the Galapagos. Image Quality: Let's get the good news out of the way first: if you like detail, the G3 very well may deliver what you want. It seems to have a lax anti-aliasing filter, because I'm seeing clear (false) detail above the Nyquist frequency in raw files. Coupled with the good m4/3 lenses, the G3's 16mp sensor can produce quite a bit of detail. It resolves slightly above its class. The strange thing is that I don't see a big falloff in the sensor's capability in raw files until I get to ISO 1600. Put another way, I find that I can generate better JPEGs out of my ISO 800 raw files than Panasonic is getting out of the camera. That's not good (for JPEG shooters, at least). I'm not sure I can recommend ISO 3200 in raw, but I'm sure that I can't recommend ISO 6400: the dynamic range is crushed, the color noise if you remove it will kill detail but if you leave it will change colors. Do note that Panasonic appears to cook their raw files if you've got NR +2 set: you'll get a dramatic loss of detail if you set that with raw, at least at ISO 800 and above. 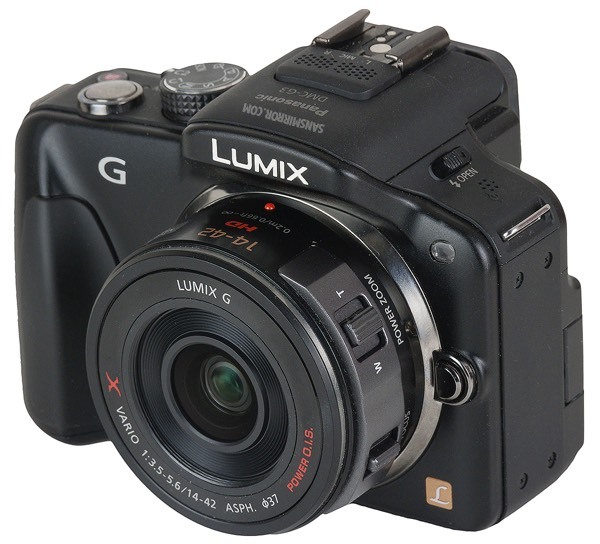 Dynamic range is not the G3's strong suit, though it is reasonable for a small sensor camera. I don't yet have a final calculation for photographic dynamic range, but it looks like it's about a stop worse than the APS cameras I've been using. That last bit might not be fully understood by everyone, so let me explain just a bit more. Let's say that my goal was to produce a slide show to be shown on my 1080P TV monitor. That's 1920x1080 pixels. Thus, we'll be downsizing both the output of the 12mp Olympus and 16mp Panasonic. In this test--assuming I shot raw and was allowed to process the images myself--I'm pretty sure that I can make the G3 image look better every time. It would look "sharper," all else equal. More pixels does have its rewards, and it's not always at the blow-it-up-as-big-as-you-can game. Love the camera, like the output. I'd rather have it the other way around, but the G3 is not to be scoffed at: it produces credible results under almost any scenario you'd throw at it, good results if you shoot raw and pay attention to camera settings and are reasonable good at raw conversion, great results within a very narrow range (moderate contrast scenes at base ISO converted with care). EVF Sticks Out. Just makes for a bit of an awkward thing, as you no longer have a box, but a box with an appendage. JPEG Processing a Bit Behind. Venus is a bit behind the other imaging ASICs. Handles Like a Small DSLR.�Quacks like a DSLR, waddles like a DSLR, just slower to focus than a DSLR. Excellent Controls and Configurability. If you're a control freak, the G3 won't freak you out like some mirrorless cameras will.